Ugg boots have been on my three girls’ Christmas wish lists consistently for over a decade now, and they’ve wore out several pairs of Ugg name brand boots as well as Ugg replica boots alike. Since one of the most searched for shoes on our website is “knock-off uggs“, it appears several others want Uggs as well, but don’t want the hefty price-tag that comes with them! 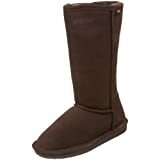 Over the years, I’ve recommended various brands that similar to Uggs, such as Bearpaw and Brumby which both use sheepskin shearling like real Ugg boots, but are less than half the price. This year, I also recommend DAWGS boots! Get look-a-like UGG replicas with DAWGS Australian Style Microfiber Boots for only $39.99-$44.99 when you use Code: AFF50 for 50% off Storewide + Free Shipping! Coupon is valid through 12/20/15. DAWGS have great ratings and reviews! Please note that DAWGS are “Australian Style” so look like Ugg Boots, but are not real sheepskin shearling – they are vegan!